From crisis to between covers in 19 months: Congratulations, Flavia! It’s true: our friend Flavia from Ferule and Fescue has a real, live, codex book in her delicate hands as of yesterday! Some of you may remember that she was in crisis mode just 19 months ago, when after two years and two rounds of reviews solicited not together but seriatum, her would-be publisher dropped her project like a hot rock. Oh noes!!! 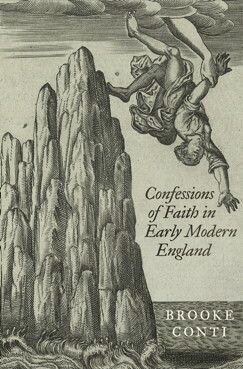 Penn Press must have snapped her project up in a Philadelphia minute, and here it is: Confessions of Faith in Early Modern England. Order it for yourself or or university’s library now! Now we can see that all’s well that ends well, and life’s a comedy (so far), not tragedy (yet, anyway.) Congratulations, Flavia! And your sabbatical is only half over. . . what will you manage to accomplish in the next six months? A resolution to the crisis in Ukraine? Peace among U.S.-based scholars on BDS? Who know what else she can do, friends? Aw, shucks. You’re the sweetest. Funnily enough, this is exactly what Cosimo said to me last night — he reminded me that it had just been a year and a half since we were running around Rome looking for oversized envelopes and a printer so I could send the proposal and sample chapters out to new presses. But yeah. None of us can see around corners and it’s useful to remember how quickly things can change (at least in retrospect! it never seems quick at the time). Of course, Jefferson had a lot of other people working for his good fortune, but you’ve done pretty well for yourself on your own! Oh, and I should note that ALL YOU PEOPLE are thanked in the acknowledgements (not individually by name, obvs — but along with my awesome departmental and in-field colleagues, my internet peeps truly make my life as an academic richer, smarter, better). So exciting to see the book. And I agree, the important part of the story is the way Flavia picked herself up after being strung out and then dumped by the first press! Now, off to order for the library…. Congrats to Flavia! I just emailed a friend who studies the English Reformation to let hir know to check it out. Nice work Flavia: you are really a model for all of us. You certainly were for me when I started the bloggy business, and book finishing is hard even without bumps in the road.